Tomomi Inada (稲田朋美) is a right-wing member of the parliament and the Minister of Defense under Abe administration (2016-). As a lawyer, Inada represented the families of Japanese soldiers executed as war criminals involved in Nanking atrocities against newspapers that reported the war crime. She was recruited by Shinzo Abe, then the acting secretary general of the Liberal Democratic Party, to run for the House of Representatives after Abe heard Inada give a talk on the topic at the headquarters of the party. 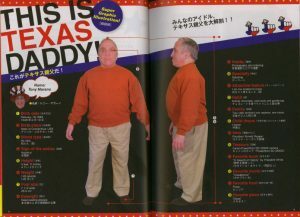 Recognized as among the most hard-line nationalists when it comes to the issue of Japan’s past, Inada signed on to both The Facts (2007) and Yes, we remember the facts. 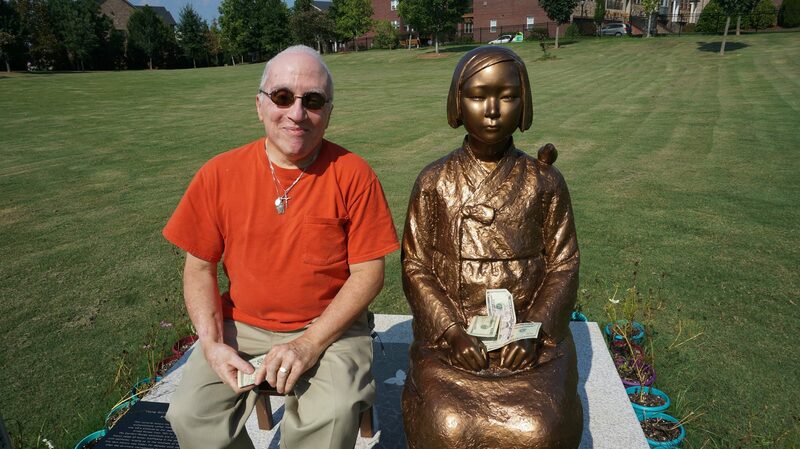 (2012), opinion ads published in U.S. media to dispute historical orthodoxy on comfort women. Her appointment to Defense Minister by Abe led to a widespread concern about the further militarization of Japan. Interestingly, Inada is surprisingly pro-LGBT, having proposed a legislation to combat discrimination against the LGBT community. In 2016, Inada claimed that LGBT groups in San Francisco supported Japanese Consulate’s campaign to prevent the establishment of a comfort women memorial in the city as a reason to support LGBT rights, but there is no evidence that any LGBT group took a position on the issue, let alone an opposition to the memorial. On the contrary, prominent Asian American LGBT leaders endorsed the memorial along with other Asian American community members. 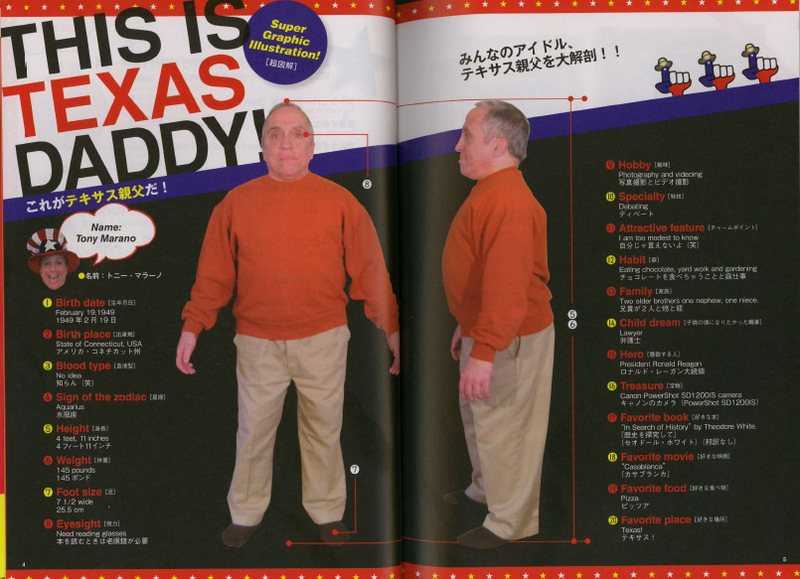 Inada is a member of the parliamentary Japan Conference caucus. Toronto Seiron (トロント正論の会) is a group made up of Japanese nationalists and comfort women deniers in Toronto, Canada. Leaders include Sharon Isac and Toshie Marinov, both Japanese women married to Canadian citizens. 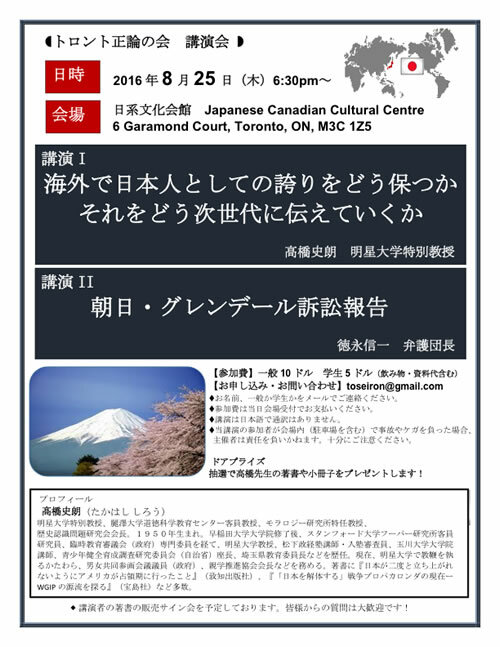 In August 2016, Toronto Seiron hosted Shiro Takahashi and Shinichi Tokunaga, who also spoke at Himawari Japan Lectures (2016) in New York City, to present about the comfort women issue and “preserving Japanese spirit” while living outside of Japan. Earlier in the same month, members of Toronto Seiron also infiltrated a memorial tribute to the victims of Hiroshima atomic bomb attack with offensive signs calling for Japan’s re-armament and denying Nanking atrocities. 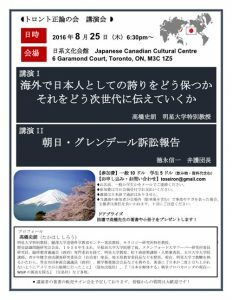 On August 25, 2016, Japanese nationalist group Toronto Seiron hosted presentations by Shiro Takahashi and Shinichi Tokunaga who also spoke at Himawari Japan Lectures (2016) two days earlier. Takahashi spoke about preserving Japanese pride while living outside Japan, while Tokunaga discussed his lawsuit against Asahi Shimbun over its coverage of comfort women issues. Toru Hashimoto (橋下徹) is a former Mayor of the City of Osaka, Governor of the Prefecture of Osaka, and the leader of Osaka Ishin movement (Japan Innovation Party, Innovation from Osaka, etc.). Hashimoto announced retirement from politics in December 2015 after his term as the Osaka Mayor expired, but continues to serve as the legal and policy advisor to the Nippon Ishin no Kai (日本維新の会). In May 2013, while he was the Osaka Mayor, Hashimoto argued that “in the circumstances in which bullets are flying like rain and wind, the soldiers are running around at the risk of losing their lives… if you want them to have a rest in such a situation, a comfort women system is necessary: anyone can understand that.” He further suggested that the U.S. military should utilize legalized sexual services to reduce sexual violence committed by members of the U.S. Armed Forces in Okinawa. In response, U.S. Department of State spokesperson Jen Psaki immediately criticized Hashimoto’s statement “outrageous and offensive,” and the City and County of San Francisco asked Hashimoto to cancel his planned sister city visit. Two weeks later, Hashimoto retracts his comment about U.S. service members while insisting that the comfort women system was similar to legalized prostitution at the time and that the Japanese military was not involved at all in the trafficking of comfort women during the WWII. The City and County of San Francisco adapted a resolution condemning Hashimoto’s statement in June. In July 2015, as the City and County of San Francisco considered a resolution establishing a comfort women memorial in a city’s public park, Mayor Hashimoto criticized the resolution as “unfair” and sent a letter opposing the memorial.